CTI will host the public event “Exploring American Sacred Values” on Thursday, Feb. 21, at the Harvey B. Gantt Center for African-American Arts+Culture, as part of CTI’s Teachers As Scholars series. 2018 CTI Seminar Leader Kendal Mobley, assistant professor of religion at Johnson C. Smith University, will discuss American civil religion as “religion repurposed to infuse the present political order and with sacred significance and authority,” and how it shapes current national traditions, symbols and beliefs. The Feb. 21 program also features presentations and discussions with CTI Fellows in the 2018 Exploring American Sacred Values seminar who studied the topic together in 2018. Four Fellows (Charlotte-Mecklenburg Schools teachers) will deliver mini-presentations on curricula they developed in the seminar that examine: CMS values related to America’s founding fathers, pay-for-play in college sports, forced conformity in early Native American schools and media influence on social values and the American dream. Additional Fellows will share their new curricula on the topic via poster presentations. This CTI event begins with an opening reception at 5:30 p.m., where attendees can view Fellows’ curriculum exhibits related to American values that the teachers targeted to address with students. 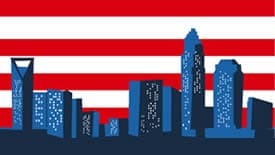 Topics include: how Charlotte’s Excelsior Club nurtured community; segregation, civil rights and legislation; voting as a civic duty; oppression of women; acculturation of English language learners; and what it means to be an American. Reception guests can also view the Gantt Center’s What We Ask Is Simple exhibition about 20th-century protest and Welcome to Brookhill a display about economic equity and affordable housing. 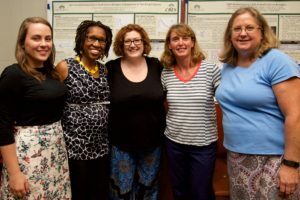 “Exploring American Sacred Values” is part of CTI’s “Teachers as Scholars” educational series for the public that highlights collaborative work by professors and teachers in CTI seminars. This Feb. 21 event is supported by a grant from UNC Charlotte’s Chancellor’s Diversity Challenge Fund and Johnson C. Smith University. This event is free and open to the public. Guests are encouraged to REGISTER HERE. Posted on February 5, 2019 by Robin Mara. This entry was posted in Events. Bookmark the permalink.